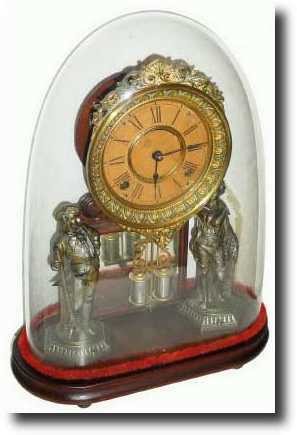 C.1880, Ansonia Clock Co., "Crystal Palace No. 1. Extra" shelf clock This clock appears in very nice condition with original figures (Rifleman and Fisherman), pendulum, hands and dial. The dial is a little brown from age and the only unfortunate problem is a large piece of glass missing from the lower back of the dome. We cannot guarantee shipment of this dome intact. Height 18"